The Bachelor of Nursing with Honours in General Health Care is a five-year programme. 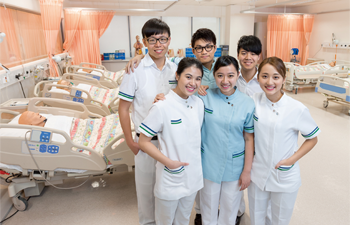 This five-year nursing programme aims to equip students with the essential knowledge and skills to become competent Registered Nurses (General) in Hong Kong. They provide a challenge to people who are interested in working in the health care field and have a vision of providing high-quality nursing care in the general area. The programme is designed according to the requirements set by the Nursing Council of Hong Kong for training of Registered Nurses (General) and has gained professional accreditation. Graduates of the Bachelor of Nursing with Honours in General Health Care can register as Registered Nurse (General) in the Nursing Council of Hong Kong. The programme prepares students to be Registered Nurses (General) and practice in Hong Kong. Upon obtaining the academic and professional qualification, graduates can work as Registered Nurses (General) in various health care settings, such as hospitals, clinics, rehabilitation centres and residential care homes.